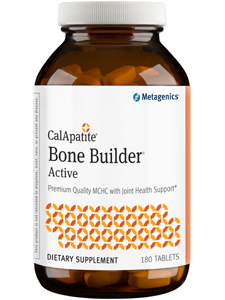 Cal Apatite® Bone Builder® Active provides excellent bone health support with microcrystalline hydroxyapatite concentrate (MCHC), a highly absorbable crystalline compound that provides everything found in healthy bones and is backed by more than 30 years of research. MCHC contains naturally occurring calcium, phosphorous, trace amounts of other minerals, bone growth factors, and collagen and other vital bone proteins. Microcrystalline hydroxyapatite concentrate, dicalcium phosphate, magnesium bisglycinate, microcrystalline cellulose, Ultra Potent-C® [calcium ascorbate, niacinamide ascorbate, ascorbic acid, sodium ascorbate, magnesium ascorbate, L-lysine HCl, ascorbyl palmitate, potassium ascorbate, citrus bioflavonoid complex, tetrasodium pyrophosphate, alpha D-ribofuranose, L-cysteine HCI, xylitol, and L-glutathione], glucosamine sulfate potassium chloride [crustacean shellfish (crab shells, shrimp)], croscarmellose sodium, cellulose, stearic acid (vegetable), horsetail extract, silica, zinc citrate, magnesium stearate (vegetable), copper lysinate HCl, chromium citrate, boron citrate, cholecalciferol, manganese citrate, niacinamide, and coating (hypromellose, medium chain triglycerides, and hydroxypropylcellulose). Contains: crustacean shellfish (crab shells, shrimp).